You can see the plans, etc., by clicking here. The applcation number is 14/00354/FUL. Unusually, three of them are motor caravans. I have reported the incursion to the West Berkshire Council traveller liaison officer and to the police (reference number 999 with today’s date). I have also contacted British Transport Police and tweeted First Great Western in a effort to get the height restrictor in the station car park locked. In the past, I have found it almost impossible to contact the station manager. Thank you for speaking with me last week. Further to my email of 10 December, the proposed solutions have been reviewed at our risk review meeting and I am pleased to confirm the site has been approved for refurbishment. The scope of work is still to be finalised, however, this includes new pumps, a new control panel and a new valve chamber. At this stage, I am unable to confirm when the refurbishment will be done but as soon as I have further information I will update you. I hope you find this information useful. However, if you would like to speak to me about this matter, please call me on 08456 410016, extension 69649. I am available from 9am and 5pm, Monday to Friday. The work is different from what I was originally told was planned. I will ask Shazia for reassurance that the refurbished pump will be able to cope with the high levels of groundwater ingress that the sewer suffers. A concerned resident has told me that advertising leaflets have been left hanging out of letterboxes in Meadow Way. These could be an invitation to burglars as they suggest that no-one is at home. I suggest that you check your letterbox and remove any offending leaflet. If you know that a neighbour is not at home, then please check their letterbox too. The leaflet is advertising the services of a company based in London. I wouldn’t have thought that a reputable company would have to tout so far afield for business. I have complained to the advertiser. Businesses in West Berkshire affected by flooding can apply for grants. I am trying to contact as many businesses in Arrowhead Road as I can as I know many were affected by flooding. This building will contain the new booking office and "retail unit". There is still no news on the approval for the new footbridge and lifts required from the Department of Transport. The approval is required because the tenders for the work came in over the budget. Road users, local residents and businesses can find out more next week about proposals to transform the M4 into one of the longest stretches of ‘smart motorway’ in England by 2021. The improvement, between junction 3, Hayes in London, and junction 12, Theale in Berkshire, would increase capacity, improve journey reliability and maintain safety. The proposals are part of the Government’s investment into England’s motorways and major A-roads, which will see up to £3 billion a year pumped into improving the roads by 2021, underpinning economic growth and high quality jobs across the region. “The M4 is an important corridor in and out of London for those who live and work in Buckinghamshire and Berkshire, as well as those further afield in the South West and Wales, with around 130,000 vehicles using this stretch every day. “Based on proven benefits elsewhere, we have produced outline proposals that would see 32 miles of the M4 transformed into a ‘smart motorway’; we’re planning extra capacity by converting the hard shoulder into an additional traffic lane and introducing variable mandatory speed limits displayed overhead to help smooth the flow of traffic and reduce congestion, and to provide traffic information, with safety bays in place to maintain safety. Subject to gaining consent, construction would be carefully planned to be carried out in phases from 2016. * There would be 64 miles of new traffic lane taken from the existing hard shoulder, increasing capacity. * The initial scheme design also includes 131 new gantries, with 32 existing gantries remaining. * 11 bridges would be rebuilt to provide space for the additional traffic lane and provide safe journeys over the M4 for decades to come. * 32 refuge bays are proposed alongside the carriageway for use by drivers in an emergency. * Tuesday 18 March between 2pm and 8pm – St Giles Hotel, Hounslow Road, Feltham, TW14 9AD. * Wednesday 19 March between 2pm and 8pm – Hillingdon Baptist Church, 25 Hercies Road, Uxbridge UB10 9LS. * Friday 21 March between 2pm and 8pm – Theale Village Hall, Englefield Road, Reading, RG7 5AS. * Saturday 22 March between 10am and 4pm – Holyport War Memorial Hall, Moneyrow Green, Holyport, Maidenhead, Berkshire, SL6 2NA. * Thursday 27 March between 2pm and 8pm – Copthorne Hotel Slough, Cippenham Lane, Slough, Berkshire, SL1 2YE. * Friday 28 March between 2pm and 8pm – Winnersh Community Centre, New Road, Wokingham RG41 5DU. * Saturday 29 March between 10am and 4pm - St Martin’s Church Hall, Church Road, West Drayton UB7 7PT. An event will be held in Theale Village Hall to inform residents about the so-called "Smart Motorway" scheme for the M4. This will allow "all-lane" running between junctions 3 and 12 of the A4 by allowing vehicles to run on the hard shoulder. This will be controlled by signal gantries. There will be lay-bys at intervals to allow vehicles to pull off the road in emergencies. There is likely to be variable speed limits enforced by cameras. The event will run from 2pm to 8pm next Friday, the 21st March. Information from the Highways Agency on "Smart Motorways" can be found here. One of the pumps at the sewage pumping station at the corner of Lambfields and Church Street had been taken away for repair. Now the other one has broken down. A Thames Water employee that I spoke to on-site told me that they cannot repair the pump until the level of effluent has been reduced by pumping into tankers. This may take a couple of days. The site is outside the settlement boundary of Theale. No mitigation measures to deal with the impact of the development on local infrastructure or services. (Please note that the above is my precis of the reasons given in the Refusal Notice). Reason 1 is a surprise as the site formed part of the Lakeside site, which was a "Special Site" in the old Local Plan. It is also adjacent to the North Lakeside site (also outside the settlement boundary) that has planning permission for 350 homes. Before the library was built, Theale was served by a container library. This was housed in a container on a lorry trailer that was brought to the village once a week. It had no windows and you had to climb several steps as it was almost two metres (six feet) above ground level. It did have air conditioning to prevent it getting too hot in the sun. This year will also be the 10th anniversary of the library's expansion. 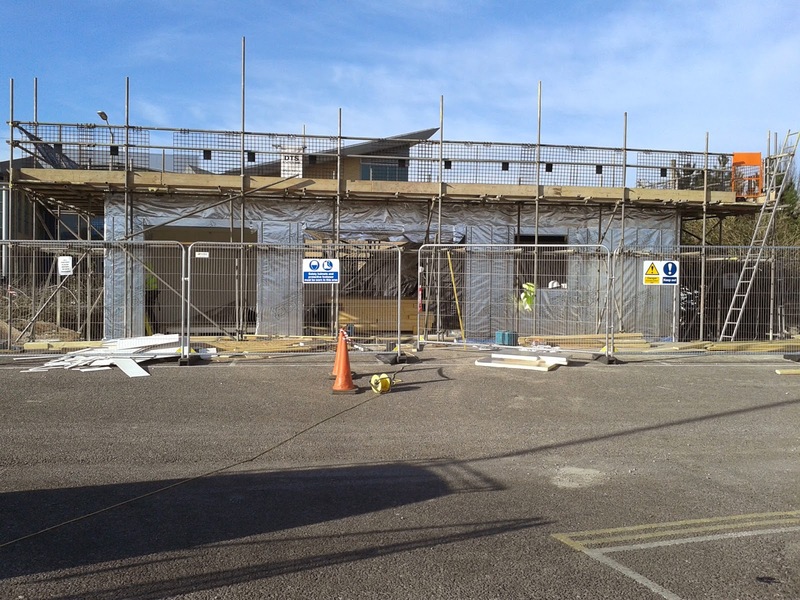 It looks like construction work on the improvements to Theale Station has started. However, there is still no news on the much needed lifts to the platforms. Mad Hatter's Tea Party at Theale Library 3:30 to 5pm on March 6th. Free!